The Helix Jr. gimbal from Letus35 is your perfect solution for small to mid-size cameras such as DSLRs or mirrorless. This rig supports up to a 12 pound payload. Balance and Calibration are both made easy with the Helix Jr. Give your video a boost with fluid and smooth movement. 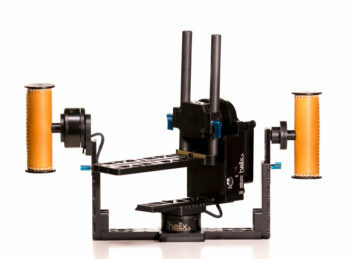 The kit comes with the gimbal, 2 batteries, a mounting plate and weights for balance.